My kids don’t go back to school until after Labour Day in September. I know from past experience that it creeps up fast so I’ve already started my back to school shopping. The list is pretty long with two daughters and one going into her first year of high school this year too- oh boy! I mentioned a couple weeks ago that we do quite a bit of our back to school shopping at Sears and have for years. They always have great selection and prices. 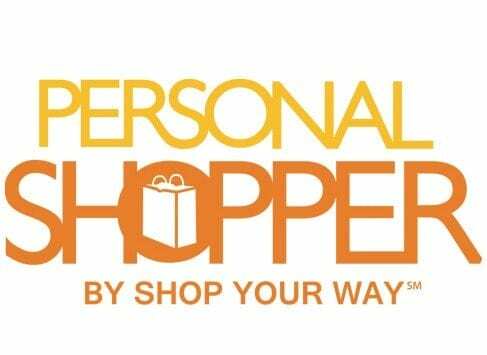 I also introduced you to the Personal Shopper program by Shop Your Way. This program is free to join and allows you to help your friends and family by recommending products, building personalized catalogs and more. It’s a great opportunity to earn some extra money doing something you love! I compiled my own back to school catalog with products my kids will need for back to school. Clothes take up a big chunk of my back to school budget. My oldest loves skinny jeans. 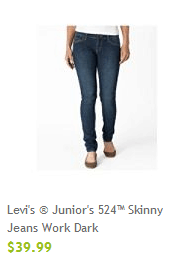 These Levi’s ® Junior’s 524™ Skinny Jeans Work Dark are really cute and only $39.99! 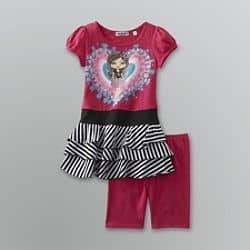 For Bridget, I found Girl Code Girl’s T-Shirt Dress and Leggings. Isn’t it adorable? Only $17.99 too! The girls get new sneakers each year for gym class. Olivia now wears the same size shoes as me so she is into Women’s shoes. 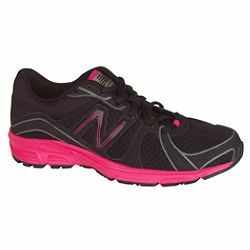 This pair of New Balance Women’s Shoe 490 Running Shoe Black would be perfect for her. I found a shoe with a similar look as Olivia’s for Bridget who looks up to her big sister and wants to have the same things as her. 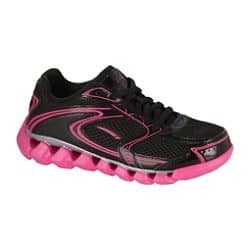 This one is LA Gear Youth Girl’s Flash Lightweight Athletic Shoe – Black/Pink. 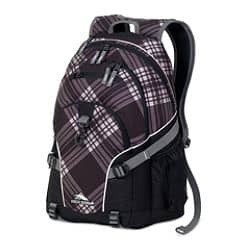 I like to buy the girls a new backpack each year too. This High Sierra BACKPACK LOOP DIAGONAL looks like it would be a good fit for Olivia. She needs something roomy to carry home all her books. 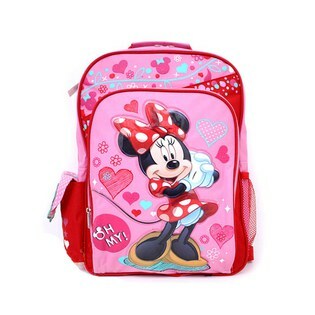 For Bridget, this Disney Minnie Mouse Sweet Sugar Large Backpack is adorable! She loves anything Disney. That was fun! Of course, I could go on and on with everything else I want to buy them, but then this post would be a mile long. As a Personal Shopper, you can do the same thing! It’s fun to build catalogs for your friends and family with items you know they would like and need. You earn a 1% commission on every purchase they make. After you have 20 clients, you will earn an additional 1% commission when they use their Shop Your Way Rewards membership number when they make purchases online or in the stores (Kmart, Sears, Sears Outlet, Sears Marketplace). Sign up today as a Personal Shopper with Shop Your Way and take advantage of this great opportunity to earn some extra cash! Also they check once a month when you’ve earned $20 or more. have had shop your way program for over a yr. and not only do i use it at sears, but i also use it at kmart.. i love hoe=w you can earn rewards when a friemd buys qualifying purchases.. I learned that its a great way to shop and earn rewards and you can also have your friends sign up and earn more rewards and thank you for doing this giveaway! That they’ll send a check once a month once you’ve reached $20……Thanks! I learned that when my friends make qualifying purchases using their SYWR number, you earn 1% of the qualifying amount. I think it’s great that they send you a check once a month after $20! Learned that payments are made after $20 has been earned. I can earn 1% of the qualifying amount of my friend’s purchase. They send you a check once a month when you’ve earned $20 or more, this would be awesome!! When friend’s buy I make money. I learned that the stores include Craftsman. That’s handy! I learned they’ll send you a check once a month when you’ve earned $20 or more. I learned that you earn 1% of your friends’ purchases. I learned that you are paid 1% Commission on all qualifying purchases made by your clients and if you have 20 or more clients who make a purchase you are eligible to earn an additional 1% Commission. I learned that I could earn 1% on the purchases my friends make through the program. I learned that I can earn a percentage of what someone buys through this program! I learned they send a check every month if you reach $20 or more. I like this better than eBates! We’ll send you a check once a month when you’ve earned $20 or more. You can earn 1% + bonus commission on everything your referred friends purchase! I learned that you can get special offers on your iPhone. It’s cool how you can earn rewards just for shopping. I love that you can get checks starting at $20. They send you checks once a month after you hit $20…awesome! You can create a list full of just about anything! And it’s super easy to sort them and put them together. I learned that they send out checks once a month once $20 minimum is reached. If you are someone’s personal shopper then you make 1% from their purchases. thank you! I learned that you make 1% of the qualifying amount when your friends make a purchase. When an online or in-store qualifying purchase is made by a client, you will earn 1% Commission, as long as your client uses their SYWR membership number when purchasing online or in a store. On the 15th of each month we will send you a check for Commission you earned in the previous month, as long as that Commission is $20 or more. If you earned less than $20 Commission, we will carry over the total amount we owe to the next calendar month or months. Your Commission check will be mailed to the mailing address you provided in your W9 Form. I learned that you can access it through your iPhone. I would love to win the Sears gift card! You can earn rewards and get 1% of friends purchases. I learned that it kind of sounds like a pyramid scheme. But hey, at least you make money as your friends shop!